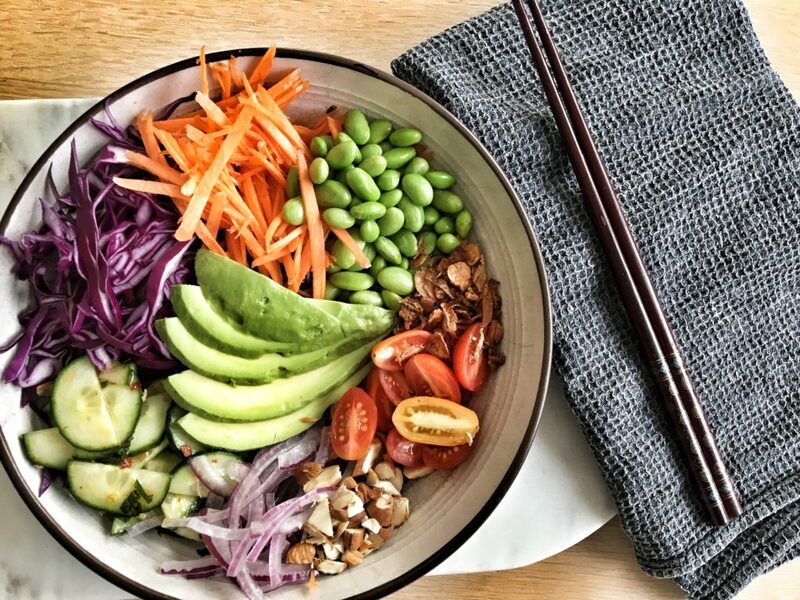 ﻿ Rainbow Buddha Bowl - I AM Co. When you hear the saying ‘eat the rainbow’, it’s not in reference to the Skittle motto. We’re guessing you’re reading this because you already have a pretty healthy relationship with food, maybe you want some healthy food inspiration or your trying to be a bit better with your food choices? The saying ‘eat the rainbow’ is more than just a good story for social media. There’s significant links between the colours of of certain foods and an abundance of specific nutrients and a clear reason why you should regularly see a rainbow of colour on your plate. Wasabi mayonaise (we used Ceres Organics Egg Free Mayo with wasabi mixed in). Firstly marinate the cucumber. Slice in half lengthwise then thinly slice into half moons. Place into a bowl with chilli, ACV, coconut sugar, mint, sesame oil & seeds. Leave to marinade while you prepare the other vegetables. Thinly slice the onion and place into a bowl with cold water. This reduces the sometimes overpowering onion taste but retains the crunch. Using a mandolin or your clever knife skills (a mandolin is sooooo handy and efficient so highly recommend), thinly slice the cabbage. Cut the carrot into matchsticks or grate if wanting to save time. Blanch the edamame beans in boiling water for 30 seconds then drain. Coarsely chop the almonds and slice the cherry tomatoes in half. Slice or dice the avocado and drain off the water from the red onion. Begin arranging all the veggies in your bowl. Drizzle over a the lemon juice, zest and top with your favourite sauces.